I don’t follow football. Not really. But I am currently breathing and I do follow sports in general, so of course I heard the news when fledgling quarterback and football celebrity (soon to be outcast?) Tim Tebow was recently cut by the New England Patriots just prior to the start of the 2013-2014 season. Like it or not, pretty much anything Tebow does is national news. If you recall, a couple years ago, Tebow (former Heisman trophy winner and widely considered one of the greatest, if not more memorable, college quarterbacks in history), become the Denver Broncos starter after their QB was injured and then, through either guile and budding talent and a fierce awareness of timing, or through fluke luck and serendipity and accidental greatness, won several games in a row, including a string of comebacks, and took the Broncos into the playoffs. Media frenzy ensued. Tebow, who was already on the cusp, became a star for all kinds of reasons, only some of them to do with how he played the game of football. Many of them were to do with his religious piety, his good looks. In the off season though, Tebow was released. He spent the year with the Jets last year and saw minimal playing time and was subsequently released by the Jets, who opted not to re-sign him. They were not all that complimentary of his playing talent or future either. The dream of NFL QBdom seemed, perhaps, to have withered on the vine for a player whose media profile far outshone either his talent or his accomplishments on the field. Suddenly the fact that Tebow was not an NFL caliber QB seemed rather obvious. Now, coming full circle, the Patriots recently surprised everyone and signed Tebow and brought him to training camp, only to release him, leaving him hapless, team-less, and it would seem, lost. A couple days ago, it was revealed that Tebow had been getting offers, from the CFL, from the USA Rugby team, and even from another NFL team, though the latter involved a position change. People wanted Tebow after all, though they wanted him on their terms. Tebow has refused them all. He has decided, at least for now, to hold tight to his dream of being an NFL quarterback and to move in dogged pursuit of it, regardless of obstacle or consequence. Even if no one else believes Tebow can or will achieve his goal, Tebow himself seems to. And that’s commendable. Of course, if the window on those other opportunities closes at roughly the same rate that the one on his NFL dream and he manages to get himself through neither, everyone’s feelings may change on the matter. For now, though, it’s NFL or bust. Carol Dweck is a Stanford professor of psychology whose similarities to Tebow probably end at two limbs and a beating heart. But whether he knows it or not, Tebow’s dedication to achieving his goal is a great examples of what Dweck would call a “Growth” Mindset. This as opposed to a “Fixed” Mindset. In layman’s terms, those with a Fixed Mindset see ability, talent, and intelligence as “fixed,” unable to really be changed even in the face of effort or will. In this mindset, people are less willing to adapt, less open to feedback, and have a more difficult time responding to criticism and adversity. Conversely, those with a Growth Mindset believe that effort, belief, and a willingness to take extra time and receive extra support as the means to gain what one wants trump any notions of existing ability, talent, or intelligence. Having a Growth Mindset doesn’t mean that you can defy the laws of physics or that anyone could be Michael Jordan. What it means, though, is that you’re far more focused on adaptation and support, believing that you can grow and improve no matter what the circumstances. Science supports the theory and the fact that one’s capabilities are not at the mercy of pre-existing conditions. They can be changed, not just physiologically, but chemically. There’s a great TED talk on the two mindsets by Eduardo Briceno. It’s ten minutes and well worth your time. It might just change the way you think about yourself and the world. As you probably know, I’m a high school teacher and I’m starting off the new school year with a unit on brain science, learning, and Mindset. There’s some very cool new revelations regarding what we know about the brain and its capacity to grow, change, and improve. All the time, I bump into students with a Fixed Mindset about school. They believe they are a certain kind of student. They believe that it’s all too hard. Or all too easy. Or that no one likes them. Or that everyone likes them. Or that math is just something they’ll never get. Or that a teacher’s feedback on their writing is worthless because they’re just not a good writer. What I’m learning is that these mindsets play a huge role in how we see ourselves and how we interact with the world. Worrying less about what we can do well naturally, worrying less about talent and natural ability, and worrying more about growth and adaptation, can put someone in a far better position to improve, and not just in the short term. What’s interesting about Mindset is that it’s not just formed by us. In fact, a lot of our own mindset about ourselves comes from the outside. Parents, friends, coaches, teachers–they tell us things about ourselves, things that might be mirrored in our day to day experience, and before too long, that becomes our narrative of ourselves. What’s fascinating about Tebow is how much the external narrative around him has changed. A few years ago, this guy was winning the Heisman trophy and was the best player in college football. An unstoppable force on the field. A king. Today he’s a joke. The narrative has flipped on him. Oddly enough, the one thing that seems not to have changed in the story all that much is Tebow. His Mindset on becoming an NFL quarterback is focused and driven, seemingly undeterred by the changing story around him, which now says that he can’t do it, that he’s not talented enough, that it won’t happen. Tebow isn’t listening. Or he’s doing an amazing job or pretending he’s not. The guy simply believes that his desire to be an NFL quarterback and his ability to grow towards that goal is more powerful than whatever natural ability landed him in this position in the first place. If he can just put in enough time and effort, he can will himself past some limitations he’s now experiencing in natural ability. In spite of the odds, he’s chosen to focus on that. Maybe he’s deluding himself. Maybe he’s exercising a genius of will that’s unfamiliar. He’ll probably never know, but he’s putting Dweck’s theory to a very high profile test. Who knows what will happen. Maybe he’ll make it, maybe he won’t. Maybe in a few years he’ll be on Hollywood Squares. I honestly don’t really care whether Tim Tebow makes it as an NFL quarterback. But his belief in himself made me sit up and take notice. 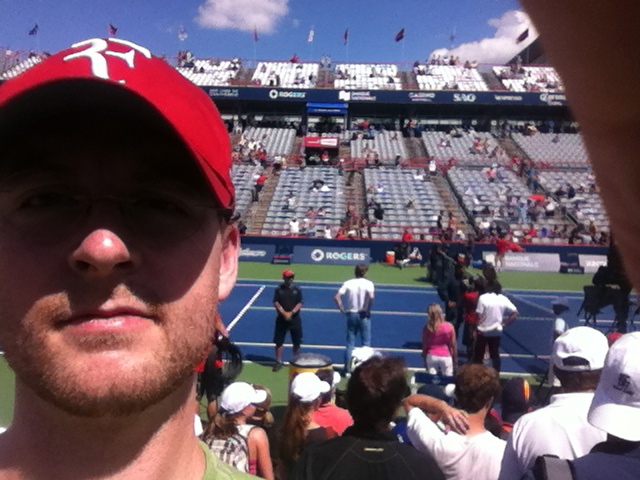 I ventured up to Montreal last week to catch the third round of the Roger’s Cup tennis tournament. The Roger’s Cup is part of the Emirates Airlines U.S. Open Series and an ATP Masters 1000 tournament, which basically is a fancy way of saying that it’s a big time event at which players stand to earn serious prize money and ranking points and therefore attracts the best players in the world. It’s also only two hours from my house, which makes me having never gone seem really stupid. Montreal and Toronto both host Roger’s Cup tournaments simultaneously and the genders alternate every year. This year the men were in Montreal. When I was a kid living in Indianapolis, there was a big tennis tournament downtown called the RCA Hardcourts that attracted marquee talent and I saw Courier, Martin, and Sampras back in the day, but not only has it been many many years since I’ve seen pro tennis in the flesh, I am a far bigger and more astute fan of the game now. I’m also writing a novel that’s largely about tennis, so there was a minor research component to the trip. I bought tickets for both the day and night sessions and all told I saw nearly six full matches and watched close to ten consecutive hours of tennis. And in one day I saw Rafael Nadal, Jerzy Janowicz, Andy Murray, Juan Martin Del Potro, Milos Raonic, Laender Paes, and Novak Djokovic. Damn. Here, in no particular order, are some observations on the day. 1. Even from a couple hundred feet away, you can see the intensity burning off of Nadal like steam off blacktop after summer rain. 2. Murray, great a player as he is, just ain’t that handsome. Trust me, I saw him play doubles from twenty feet away. 3. Tennis, though international, is seriously white. I saw players from all over the world, but India’s Leander Paes was the only player I saw the whole day with skin darker than a vanilla latte. 4. Beware the wrist watch tan! Never saw it coming. 5. I was foolish to think I’d be the only one there with a Roger Federer hat. They were as common as Yankees caps in the Bronx. 6. Quebecians seem not to get that more urinals would lead to shorter bathroom lines. They also seem not to get that walking faster will get you there quicker. 7. You have never seen anybody hit something as hard as Janowicz and Raonic hit their first serves. It looks fast on television, I know, though that idea of speed you get from TV does sparse justice to the cannons that these guys actually fire. 8. #7 makes you, then, fully appreciate how superhuman a top player’s reflexes and reaction time really are. Before watching for the day, I’d thought that the raw power, and seeing said power in the flesh, would be the most impressive physical thing on display. Wrong. The reflexes and timing are insane and absolutely shocked me. 9. Even watching a top player practicing is thrilling. I stood and watched Almagro for a while. (photo below) You’re ten feet away and they just pound the ball like a crazed metronome. Almagro is intense by nature, it seems, but was particularly angry seeming while I and others watched him practice. Nothing even in the vicinity of a grin out of this guy. 10. Canadians are very cool for letting you bring your own food and drink into the stadium. A little old French Canadian couple in front of me during the day session had a whole picnic lunch they slowly devoured during the Nadal/Janowicz match. 11. American tennis is officially dead. By the third round, there was not a single American left in the tournament. Nor is there currently an American in the world’s top twenty. This is bad. 12. As cool as watching the marquee matches on center court is, it’s all about the outer courts. You’re basically court side and can even better appreciate the pace of the game and the athleticism of its practitioners. When I say you’re court side I’m not kidding. 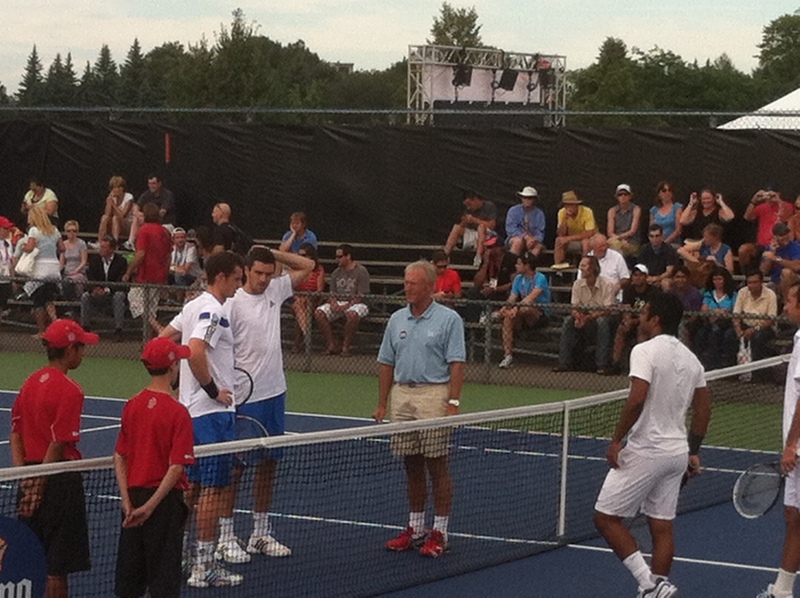 Here’s the coin toss moment before the Andy Murray/Colin Fleming VS. Leander Paes/Stepanek match. I took it from my seat with only a slight zoom. 13. In doubles, rather than play a win-by-two style Deuce, in the event of Deuce, they play a single point to decide the game in which the receiving team gets to decide who receives. This speeds up play. 14. The players carry around their own towels. On TV, it just looks like the ball kids are feeding the players towels from a massive house stash, but actually the players use the same two towels throughout the match and carry them back to their chairs during breaks, and then to the opposite end during changeovers. 15. Many players change their shirts during matches, though doubles great Daniel Nestor was the only one I saw who changed into a different shirt. 16. If you tilt the camera right, you can actually put yourself in the same frame as Nadal doing his post match interview with Pam Shriver. I’m the Mount Rushmore like face on the left; Nadal is the tiny, navy blue clad fellow on the court to the bottom right. 17. Those oversized autograph balls are way overpriced. 18. The gift shop swag is pretty crappy, and there’s basically nothing for kids. 19. There’s a lot of in and out during matches on the spectators parts. More, it seemed to me, than at other kinds of sporting events. I attribute this to the fact that there’s many matches happening simultaneously, and you can go see whatever you want at any time. 20. Because of #19, it can feel like you’re always missing something and wishing you could be two places at once. You often hear distant applause and wonder what you’re missing. 21. No line at the Canadian/US Border either coming or going = priceless. 22. I think next time I’ll still catch two consecutive sessions, though watch an evening session, stay overnight, and then the next day’s afternoon session. 23. It cost me around $200 to watch ten hours of elite level sport. If you consider that it would take four basket ball games to equal that quantity, the price seems pretty fair. 24. Though I was thrilled to see so many top players in person, Nadal, I have to say, inspired the day’s biggest man crush. Wow. I took a photo of him shirtless after the match for my wife. But I kind of wanted it too. 25. I can’t wait until my kids are old enough to bring along.